Plasma Membrane Protein Extraction Kit ab65400 provides optimized buffers and reagents for effective extraction of plasma membrane proteins from mammalian tissues and cells. Unlike other available methods that can only extract the total cellular membrane proteins (combinations of plasma and organelle membrane proteins), this kit was designed to not only extract the total cellular membrane proteins, but also to specifically purify the plasma membrane proteins. The procedure offers consistent yield and high purity (over 90%). Membrane proteins prepared using the kit can be utilized in a variety of applications, such as Western blotting, 2-D gels, and enzyme analyses, etc. The entire procedure takes less than 1 hour. Membrane Protein Extraction is a method for extraction of membrane proteins from mammalian tissues and cells. Many procedures extract total cellular membrane proteins which is a combination of plasma and organelle membrane proteins. 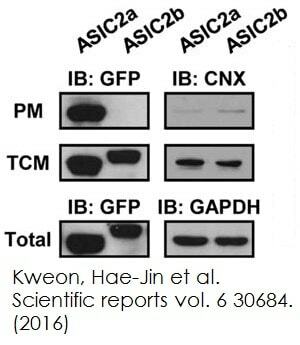 Western blotting on the plasma membrane (PM) fraction extracted useing ab65400, total cellular membrane (TCM) fraction, and total lysate of cells expressing GFP-tagged ASIC2a or ASIC2b was performed using anti-GFP antibody. As controls, the PM and the TCM fractions were blotted using anti-calnexin (CNX) antibody, and total lysate was blotted using anti-GAPDH antibody. 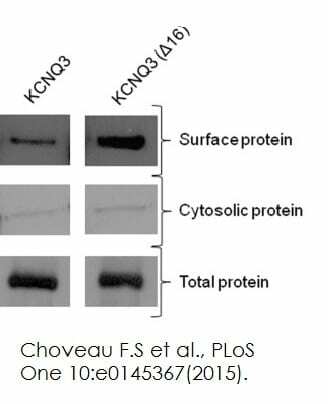 Membrane protein assay - ab65400Image from Choveau F.S et al., PLoS One 10(12), Fig 2C. Doi: 10.1371/journal.pone.0145367. Cell membrane protein was collected using plasma membrane protein extraction kit (ab65400). The upper panels show the plasma membrane myc-tagged protein; the middle panels show the cytosolic myc-tagged proteins and the lower panels show the total myc-tagged protein from CHO (Chinese Hamster ovary) whole-cell lysates. Publishing research using ab65400? Please let us know so that we can cite the reference in this datasheet. I just wanted to give an update on the replacement kit. I have had much much better success with recovering the plasma membrane fraction after we spoke on the phone. I still do not get 100% purity, but the contamination is not too bad. I never have contamination from the nuclear fraction (probing for p84), but occasionally small contamination when I probe with a cytosolic marker. I would recommend against using a housekeeping gene like tubulin as a cytosolic marker, as I always see that in my plasma membrane fraction, but the sample looks much cleaner when I use a different cytosolic marker (eg GSTpi). Finally, I think what helped the most in recovery was modifying the protocol. I would recommend to remove step 2 in Part B of the protocol, and any further steps (steps 5 and 6 in part B) that follow up from this step. I think when you try to get upper and lower phase from the mixed solution, its never as clean as it would be if you took it from the primary container, and this can lead to the sample ending up in the wrong phase because the volumes of the solution aren't as exact, especially because of viscosity differences in the upper/lower phase solutions. Also for researchers using tissue instead of cells as I am, the homogenization step is extremely important. I always use a tissue grinder before putting the sample in the dounce homogenizer, otherwise the debris pellet will be quite large. Thank you for the update. I am glad to hear the replacement kit worked out better for you. Eliminating those extra steps will probably, as you found, give purer fractions but possibly at the cost of lower yield. I am not sure why tubulin was getting pulled down with the membrane fraction; maybe it was complexed with membrane-bound proteins as suggested in the article at this page. Biochim Biophys Acta. 2009 Jul;1788(7):1415-33. Merci pour votre requête. J'ai contacté le laboratoire et ils m'ont confirmé que cette étape est pour équilibrer la "upper phase" solution. Il ne faux donc pas prendre la solution directement de la bouteille. a. you have your total membrane protein in both the phase solutions. b. you are making an equal amount upper and lower phase solutions and normalizing/equilibrating each with the other. c.you collect the upper phase solution containing the isolated memb protns. d.you reisolate the pure memb protns, with equilibrated upper phase solution. If you take this solution from the stock it will not be equilibrated and might lead to lower efficiency if isolation. J'espère que cette information clarifie le protocole. Veuillez ne pas hésiter à nous recontacter si vous avez des autres doutes ou questions. Can this kit be used to purify just the plasma membrane, rather than the plasma membrane proteins? This kit may be useful for extracting and retainingthe plasma membrane fraction without the plasma membrane proteins but it has not been specifically designed for this purpose. Please let us know how things go if you do choose to use ab65400 for this experiment. 1. I would like to isolate a 4 transmembrane protein (504 amino acid) from plasma membrane using ab65400 Plasma Membrane Protein Extraction Kit (attached please find manual). I appreciate if you could provide me this information. In addition, do you have any experience with isolation a 4 transmembrane protein using this kit? I can confirm that the kit uses an aqueous polymer two-phase system to separate plasma membranes. Most specifically it uses the PEG/ Dextran system and the plasma membrane tend to concentrate in the upper phase. I am sorry we do not have specific data for isolation of 4 transmembrane proteins using this kit. I would like to reassure you that the kit is covered by the Abpromise guarantee should it not work as expected. 1. Can this kit be used with smaller cell numbers, such as 105 or 106? If so, what protocol changes are required, if any? 2. Is there a limit to the number of transmembrane domains a protein can have and still be solubilized with this kit? 1. The smaller cell number can decrease yield. Hence it is at the user's discretion to reduce cell numbers. For some cells, based on size and density of expression of membrane proteins, smaller cell number can still yield enough membrane proteins. If cell number is reduced, reagents should be scaled down proportionally. 2. Proteins with domains spanning the plasma membrane multiple times can also be isolated by this kit. We have not specifically tested the effects specific number of TM domains domains have on membrane protein solubility using this kit. 1. I would like to isolate cell membrane protein and membrane associated protein but not mitochondrial membrane protein from fibroblasts. 3. After isolation the membrane protein would be use for WB and IP. Does this kit fits my requirements ? 1. This kit isolates the plasma membrane associated proteins as well as transmembrane proteins on the plasma membrane. Organelle membrane proteins are not isolated. If total membrane proteins were desired, you would get all membrane proteins including those from mitochondria at step A 6. 2. The membrane proteins are preserved in their native state since there are no denaturing or harsh chemicals used in this kit. I am sorry we have not specifically looked for the peptidylarginine deiminases you are interested in. 3. The proteins isolated with this kit can be used in WB and IP. Yes, this will give you two sub-cellular fractions: plasma membrane and cytosolic. So you will be able to demonstrate the relative amounts of your protein of interest in each fraction using an assay such as western blotting, assuming you have an antibody that can detect it. Do you know if this kit extract intact-native proteins? The proteins isolated when using this kit should be in their native conformation. The homogenization step is defective, I have homogenized cells in Dounce homogenizer for 50 times, when I did not get a nice result, I put the sample in liquid nitrogen, then tried to grind the sample with the Dounce homogenizer pistol. Do you have any suggestion to improve the procedure? The frozen tissue cannot be pulverized with the Dounce homogenizer. This has to be done with a pulverizer or tissue grinder. Once ground, the buffer can be used to homogenize the bits in a Dounce homogenizer. Fresh tissue can be homogenized directly and can require more passes than 50 sometimes depending on what tissue is used (muscles, cartilage etc take more passes). I am using T47D breast cancer cells. I have used around 6x 108 cells; wet weight was around 1.05 gram, so this should be enough. For homogenization I shocked freeze the sample in liquid nitrogen, and around 80% were lacking this shiny ring. After centrifugation in step 4 of extraction of total cellular membrane proteins, I got a huge nuclear pellet, I collected the supernatant. After centrifugation in step 5, I got a tiny brownish pellet; it was very small, but detectable. Then I proceeded with steps as in the protocol. At step 4 of purification of plasma membrane protein, I had a nice separation with turbid interface. At step 7, I collected 300 µl of the combined upper phase, so I added 1500 µl distilled water and centrifuged, but then I got no pellet at all. I even contacted one of the references (Ishikawa S et al. Role of connexin-43 in protective PI3K-Akt-GSK-3ß signaling in cardiomyocytes. Am J Physiol Heart Circ Physiol 302:H2536-44 (2012) ), and he kindly confirmed my steps, and stated that it is very straight forward with no tricks. You are obtaining a huge pellet after step 4. This is the low speed centrifugation at 700g and pellets down unbroken cells, nuclei and debris. Getting a huge pellet at this step is indicative of incomplete homogenization. The steps are correct but homogenization is key to getting good yields for membrane protein preps. No shiny nuclei can often be mistaken under the microscope for small cells. Also, it is important to use the correct RPM values for the spins based on the g-forces mentioned on the datasheet. The pellet after step 7 can be small and translucent sometimes stuck to the tube. Once the 1500ul water is added, it is important to have enough space in the tube for centrifugation with the proper effects. If there is not enough space, the pellet might not be obtained. I would suggest separating the sample into 2 tubes with 900ul in each tube (300ul+1500ul water =1800ul total split into 2) and then spinning. This might yield better results.